MOUNTAIN VIEW, Calif., Jan. 31, 2018 (GLOBE NEWSWIRE) -- BlueJeans Network, Inc. (https://www.bluejeans.com), the first cloud service to connect desktops, mobile devices and room systems in one video meeting, today announced that its BlueJeans Rooms with Dolby Conference Phone has enjoyed a 63 percent increase in demand during the first six months of availability. Interest in the platform supports market data1 that points to continued growth in small-to-medium meeting rooms throughout the year. Companies see these rooms as an integral part of the meeting experience where individuals and teams collaborate using technology that promotes idea creation and sharing. A new configuration of the product will focus on a premium voice and content sharing experience when video isn't required. The BlueJeans Rooms with Dolby Conference Phone featuring Spatial Audio captures the entire room's conversation with 360 degree voice pickup, making it feel as though each meeting participant is located in a different part of the room. Users hear each speaker clearly and naturally while built-in noise reduction technology limits background interruptions. 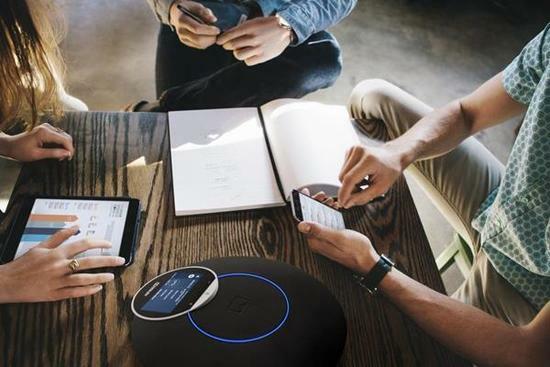 The BlueJeans one-touch feature from the Dolby Conference Phone interface creates a meeting experience that is easy to use and manage, all delivered over the internet to reduce cost and to leverage the latest in team collaboration. According to Wainhouse Research, in an end-user market survey, two-thirds of respondents (66 percent) indicate their organization plans on deploying more video conferencing equipment in small/huddle rooms1. "Enterprises seeking to video-enable their meeting rooms, as well as their general user population, should carefully consider the Dolby-enhanced BlueJeans Meetings service, as well as the BlueJeans Rooms with Dolby Conference Phone solution," said Ira Weinstein, senior analyst and partner, Wainhouse Research. "As we began with BlueJeans, I quickly realized it would address all our demands and empower me with the tools that I need. We tested the Dolby Conference Phone by the ping pong table and in other areas, and that's when we realized the power of the noise reduction technology and what a game-changer we had in front of us," said Stanislav Burdeynyy​, IT Operations Manager, Mixpanel. "We have put the BlueJeans Rooms with Dolby Conference Phone into 50 conference rooms, and my end users are thrilled by the experience that was made possible by this partnership." BlueJeans is the meetings platform for the modern workplace and the first cloud service to connect desktops, mobile devices and room systems in one video meeting. Thousands of global companies use BlueJeans every day for meetings and events, so people can work productively where and how they want. For more information, visit www.bluejeans.com. \"Enterprises seeking to video-enable their meeting rooms, as well as their general user population, should carefully consider the Dolby-enhanced BlueJeans Meetings service, as well as the BlueJeans Rooms with Dolby Conference Phone solution,\" said Ira Weinstein, senior analyst and partner, Wainhouse Research. \"As we began with BlueJeans, I quickly realized it would address all our demands and empower me with the tools that I need. We tested the Dolby Conference Phone by the ping pong table and in other areas, and that's when we realized the power of the noise reduction technology and what a game-changer we had in front of us,\" said Stanislav Burdeynyy​, IT Operations Manager, Mixpanel. \"We have put the BlueJeans Rooms with Dolby Conference Phone into 50 conference rooms, and my end users are thrilled by the experience that was made possible by this partnership.\"